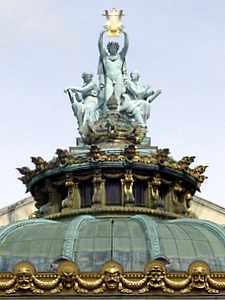 The Opera Garnier is a grand landmark at the northern end of the Avenue de l'Opéra. It is regarded as one of the architectural masterpieces of its time. 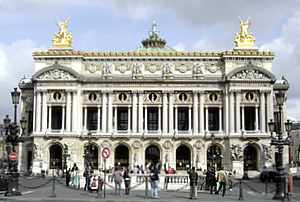 Built in the Neo-Baroque style, it is the thirteenth theatre to house the Paris Opera since it was founded by Louis XIV in 1669. 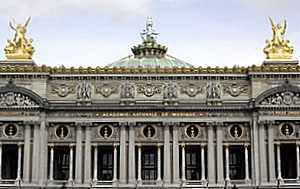 It was called the Paris Opéra, but since the building of the Opéra Bastille in 1989, it is referred to as the Opera Garnier. Also known as the Palais Garnier, it was part of the reconstruction of the city by Napoleon III and his engineer, Baron Haussmann. Following a competition for the design of the Opera, an unknown 35-year-old architect was selected, Charles Garnier (1825-1898). He would go on to also build the Opéra Garnier de Monte-Carlo in Monaco. Construction began in 1857 though interrupted by the Franco-Prussian War, the fall of the Second Empire and the Paris Commune Uprising. Another problem was the discovery of an underground lake beneath the construction site. This required the developing of an underground reservoir beneath the building. This incident was later to become the inspiration for the famous "The Phantom of the Opera". 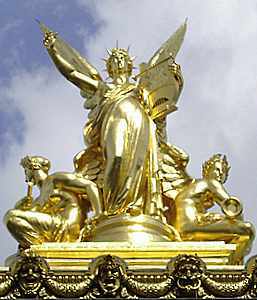 It was completed in 1874 and the Palais Garnier was formally inaugurated on January 15, 1875. This large building has a total area of 11,000 square meters (118,404 square feet) and a huge stage able to accommodate up to 450 artists. It is an ornate building and the style is monumental, opulently decorated with elaborate multi-colored marble friezes, columns, and lavish statuary. The interior is rich with velvet, gold leaf, cherubs and nymphs. The auditorium's central chandelier weighs over six tons. The ceiling was painted in 1964 by Marc Chagall. The Opera Garnier is mainly used for ballet performances. Paris' primary opera house is now the Opéra Bastille. Visits without guides are available everyday during school vacation time from 10 a.m.-4:30 p.m., or until 1 p.m. in the case of a matinee performance. The rest of the year, the building is open during the same hours on Wednesday, Saturday and Sunday. Fees are 7 euros for adults and 4 euros for students. Guided tours in English are available on the same days as above at 11:30 a.m. and 2:30 p.m.
Fees are 11 euros for adults, 9 euros for students and seniors, 6 euros for those under 12 years of age. Tickets need to be purchased 1/2 hour before the tour begins.